If you own a small business in New Jersey or are just thinking about taking the plunge, UCEDC can help you start, grow and thrive. We’re a private, non-profit economic development corporation, dedicated to boosting local economies and strengthening communities through business development and job creation. Since 1977, we’ve been helping small business by making loans, training and mentoring business owners, helping businesses obtain government contracts, and providing accurate and relevant business information. See our economic development impact in the past 10 years alone. 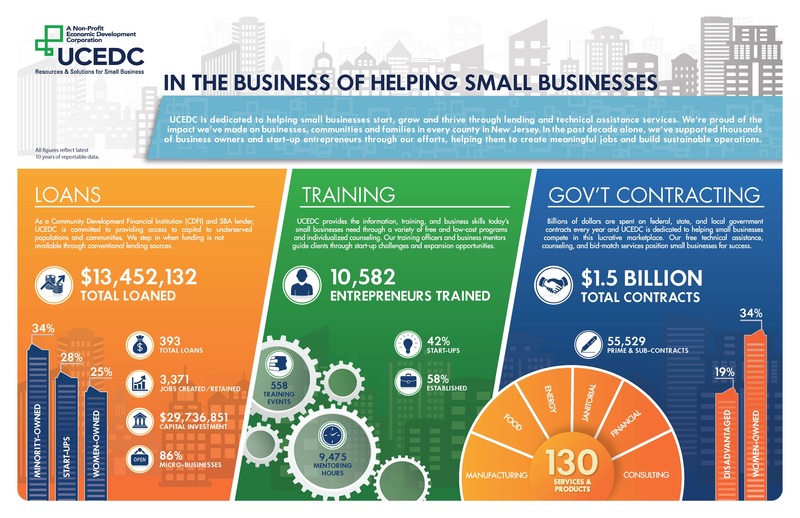 As a Community Development Financial Institution (CDFI) and SBA lender, UCEDC is committed to providing access to capital to underserved populations and communities. We step in when you can’t get the funding you need through conventional lending sources, with loans from $500 to $5 million. With a wide array of financing options, including SBA microloans, Community Advantage 7a loans, and 504 loans, we are often the answer for borrowers with little to no credit history, low-income borrowers, and women and minority entrepreneurs. Through our partnership with the New Jersey Economic Development Authority (NJEDA), we provide intensive small business training and mentorship services through our Entrepreneurial Training Initiative (ETI). Free workshops and seminars on a variety of business and financial literacy topics are offered throughout the state to help you keep pace with the challenges of business ownership. Union County businesses can rely on UCEDC’s Procurement Technical Assistance Center (PTAC) to help navigate their way through the government contracting process. Each year, federal, state, and local governments spend billions of dollars buying goods and services from small businesses, just like yours, and the PTAC team’s free counseling, technical assistance, and bid match services will position you to get your share of this lucrative market. We’re proud to have helped thousands of small businesses throughout New Jersey and look forward to working with you to create the next success story. Our Mission:UCEDC is a private non-profit Community Development Financial Institution that fosters economic growth. We accomplish this by providing financial and technical assistance to new and existing businesses with emphasis on benefiting under-served people and communities.